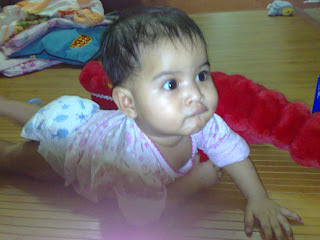 My-Alia : on See U Later, Alligator! 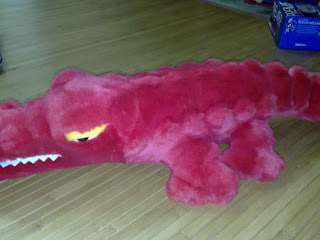 I just would like to show you guys what my mom got for Alia during her trip to Kuching, Sarawak last week..
We call it " Alligator ".. Nice, huh? :) Kaler merah lagi tu! 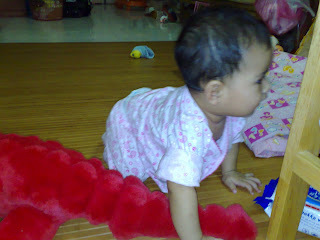 My mom (Alia's Atuk) bought it for her because thinking that She can climb over and duduk on top of the toy! Unfortunately, I don't think Alia was excited as i was/am. She buat tak tau je! ah.. betul! lagi satu, benda yg tak leh, yg itu la yg dia nak..
comelnya alia. Hihi..alligator tu pun comei gak.